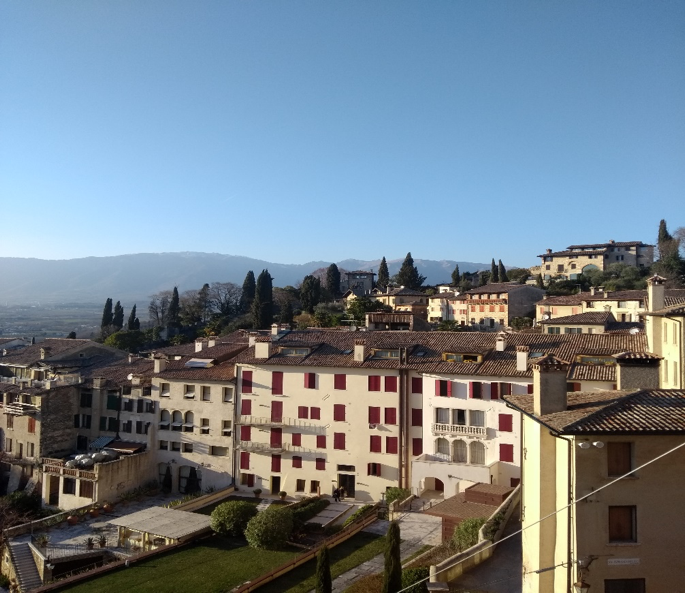 After a mere 48 hours in the beautiful walled city of Asolo, about an hour northwest of Venice and at the foothills of the Dolomites, it was abundantly clear why it had managed to capture the hearts of so many people over the years and why it remains a magnet for many fortunate enough to have a second home here. Robert Browning famously fell in love with the place, calling it a “Little England” and named his final collection of poetry “Asolando” after ‘the City of 100 Horizons’; a term coined by the 19th Century poet Giosue Carducci. Because of the city’s hilltop position, there are views from all around and with its walls, history, cobbled streets and beauty, it is also part of the borghi piu belli d’Italia club, which lists the most beautiful walled villages (or borghi) in Italy; a position that is totally justified. 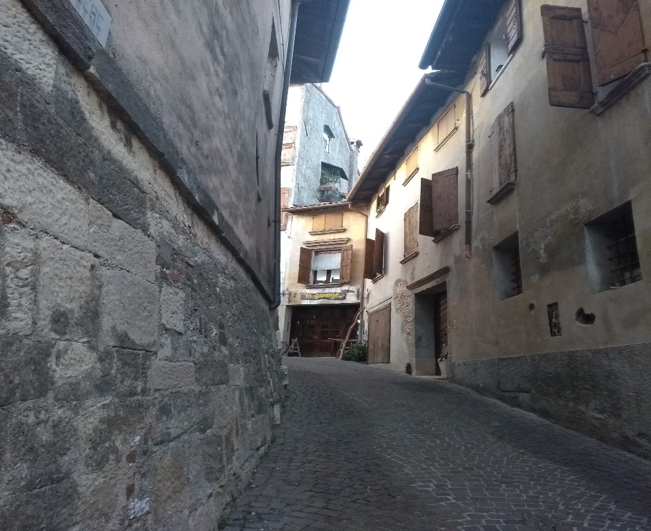 But aside from its beauty and history, one of the most charming things about Asolo is a rather unique concept that is specific to the city and that is to asolare. This is a word and indeed, a verb, sentiment and concept coined by another poet, Pietro Bembo who was affiliated to the court of Caterina Cornaro. The word means to ‘pass time in a meaningless but delightful way’ but especially to enjoy the beauty that surrounds you outside. Caterina Cornaro was arguably Asolo’s most famous citizen, along with some other strong and pioneering women such as Freya Stark, the middle-eastern explorer and Eleonora Duse - the actress famed for being the first woman to adopt method acting. Renowned for creating a court of culture at her Castello or Castle, Caterina was pretty much banished to Asolo (she was made Lady of Asolo) once she had served the needs of Venice. Those needs saw her as a 14 year old marry James II of Cyprus. They married by proxy in 1468 but when she was 18 they married in person but both her husband and baby son died leaving her as Queen until 1489 when she was forced to abdicate and return to Italy and Asolo. Asolo has over the years retained this reputation for history, culture and asolare, and indeed, wandering the cobbled streets before enjoying an Aperol Spritz is a highly recommended pastime! The Aperol Spritz is a mix of Aperol, soda and Prosecco, with the latter’s homeland being Veneto and also Fruili; the largest of any DOC. The majority of Prosecco that is made is DOC (Denominazione di origine controllata) quality level which can come from nine provinces from the two regions but there are two areas that produce top-quality Superiore DOCG (Denominazione di Origine Controllata e Garantita) wines and they are Conegliano Valdobbiadene (or Con-Val) and also Asolo (which actually resembles a small town but because it has a Cathedral and used to have a bishop, is called a City). Increasingly therefore Asolo is becoming as famed for the quality of its wines (around 90% of which is Prosecco as well as some very attractive whites and reds made from indigenous varieties such as Manzoni Bianco and Recantina) as it is for its history, culture and beauty. So what contributes to the higher quality of the Asolo Prosecco DOCG wines? Aside from lower yields, an appreciation and respect for biodiversity and the terroir which contributes a certain salinity to the wines, higher dry extract and surprisingly, an ability to age if only for a couple of years, the driving force is indisputably the people and their pride and passion. With the co-ordinating help of the Consorzio Vini Asolo Montello, headed up by the charming Armando Serena, there is a real drive and determination to produce the very best wines that they can and to differentiate them from their DOCG Con-Val neighbours and DOC generally. As a result, there are interesting trials going on with indigenous yeast, the promotion of a range of different sugar levels (with these dryer styles highlighting the minerality of the Asolo wines) aside from the ubiquitous Extra Dry which nevertheless makes up around 90% of Asolo production, and for me most interestingly of all, a style I hadn’t tried before, Col Fondo Prosecco. Col Fondo means ‘on sediment’ and for fans of ‘natural’ or low intervention wines, these are wines for you! 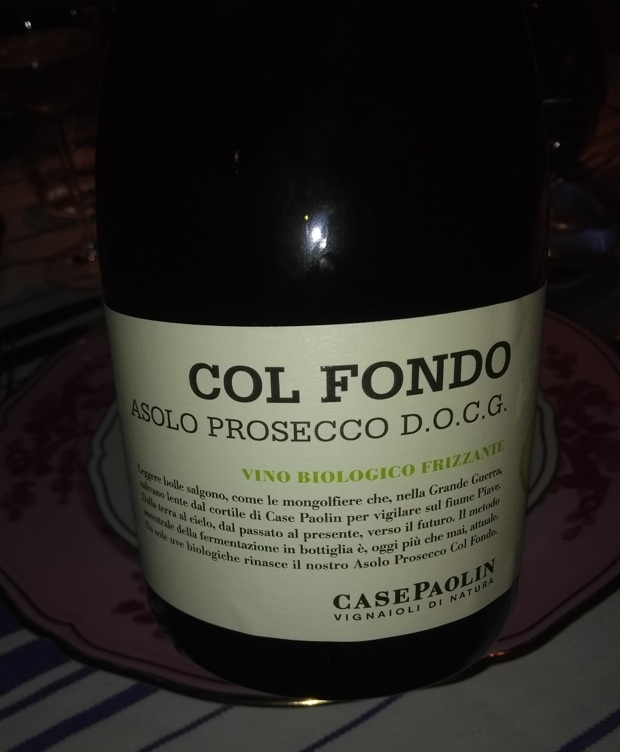 Unlike the majority of prosecco which is tank fermented, Col Fondo wines are fermented naturally in the bottle, using wild yeast. The atmospheric pressure is lower and the results are a really intriguing mix of tropical aromas such as mango and papaya with some wines being dry and others distinctly off-dry. My favourite example of this style and one of my favourite producers of the trip, alongside the ambitious Guisti, was the Case Paolin Organic Col Fondo. This expresses maximum terroir using vines that are around 30 years old. We are delighted that Case Paolin will be showing a selection of their sparkling wines at our Champagne & Sparkling Wine Festival next month. Case Paolin is owned by the Pozzobon family, father Emilio and his 3 sons; winemaker Mirco and his brothers Diego and Adelino. The 15 ha estate was certified organic in 2010, with conversion starting in 2003 and 2013 being the first vintage that was certified. Speaking to Mirco, he had a real sense of responsibility to the land and the vineyards saying that “the land is something that we rent from our sons”. This desire to preserve the health of the land has played a clear role but so too has the belief that being organic has allowed them to “obtain more quality in the grape”. The yields are smaller and the smaller berries and the balance of juice and skins results in more mousse and structure. Being in the vineyards constantly is labour intensive but checking on vine health and being hands on has huge quality benefits according to the winemaker who feels that “if you get good grapes you can’t make bad wine”. I’m not sure I agree with that but Mirco does strongly feel that 80% of a wine’s quality is established in the winery; you need great grapes to make good wine. There is no doubt however that great wines are being made at Case Paolin and that Mirco Pazzobon is an extremely talented winemaker who interestingly is consulting at Giusti and making some of their wines with the red wines coming out of both wineries, both made by Mirco, being utterly fabulous! 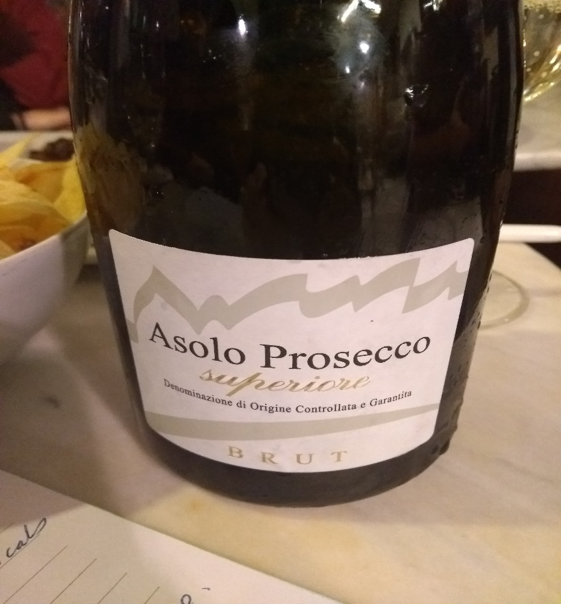 My visit to Asolo really opened my eyes to the quality and variety of Prosecco that is being produced in this stunning part of the Veneto and I shall definitely be returning for some more delicious wines (and food) and to partake again in my new favourite pastime of asolare.